Looking for the best 2018 Black Friday & Cyber Monday Canon EOS 7D Mark II deals, sales, rebates and specials? Here is the buying guide for you! Designed with a penchant for speed, the Canon EOS 7D Mark II is an exciting semi-pro DSLR camera featuring a 20.2MP APS-C CMOS Sensor, dual DIGIC 6 image processors, and a top continuous shooting rate of 10 fps. Its 10fps continuous shooting and blazing fast autofocus set it apart from most of its peers and the 7D Mark II comfortably performs in a range of challenging situations, and while ideally situated as a tool for sports and wildlife photographers. In addition, the Canon EOS 7D Mark II DSLR camera achieved an excellent 84% overall score and Silver Award from the experts at DPReview. So, if you are interested, just get it this holiday shopping season! 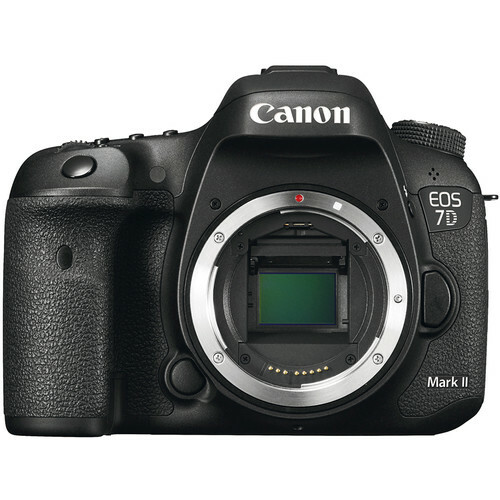 $450 off on Canon EOS 7D Mark II Body: $1,069 at Amazon, B&H, Adorama. $450 off + $350 MIR on Canon 7D Mark II with Wi-Fi Adapter Kit + Printer Bundle: $1,749 at Adorama. $250 off on Canon EOS 7D Mark II with Wi-Fi Adapter Kit: $1,399 at Amazon, B&H, Adorama. $450 off on Canon 7D Mark II w/ 18-135mm IS USM Lens & W-E1 Wi-Fi Adaper Kit: $1,799 at Amazon, B&H, Adorama.